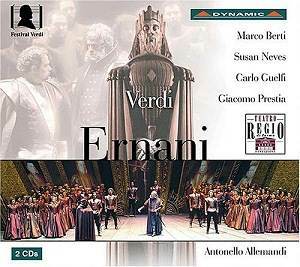 Ernani is the fifth opera in the Verdi canon. It follows immediately after Nabucco and I Lombardi premiered at La Scala in March 1841 and February 1842 respectively. These works had been resounding successes and placed Verdi, at age thirty, at the forefront of Italian opera composers. Much of this was owed to Bartolomeo Merelli who had moved from writing opera libretti, including that for Donizetti�s first great success Zoraida Di Granata (review), into opera administration as impresario of La Scala. He it was who had cajoled Verdi, depressed and reluctant to consider further composition after the fiasco of his second opera, Giorno Di Regno, to accept and peruse the libretto of Nabucco. Inspired by it Verdi took up his compositional pen again. He recognised his debt to Merelli, but somewhat superstitious of pushing his luck with another work for La Scala, refused the impresario�s blandishments for another opera. Meanwhile the Society that owned the Gran Teatro la Fenice in Venice assembled to decide on the names of opera composers for the coming season with Verdi high on the list. La Fenice was La Scala�s biggest rival in Northern Italy. Rossini had won international fame with Tancredi and L�Italiana in Algeri, both premiered at the Fenice and concluded his Italian career in triumph with Semiramide premiered on 3 February 1823. After that performance Rossini was escorted to his lodgings by a flotilla of gondolas, a water borne band playing a selection from his score. A success in Venice had its own particular flavour and the prospect was an attraction for Verdi. Count Alvise di Mocenigo, president of La Fenice, entered into correspondence with Verdi, much of which survives. The composer, aware of his increasing value drove a hard bargain by which La Fenice would stage I Lombardi as well as presenting a new opera to a libretto of Verdi�s choice. To write the verses he chose Piave who was to be his collaborator in many subsequent works. Although the subject of Ernani had already been featured in operas by others, and even considered by Bellini, Verdi�s music brought out the story as no other had done before. Verdi�s Ernani is written in traditional form with arias, cabalettas and group scenes with virile chorus contributions an additional attraction for composer and audience. Verdi brings out the character of the conflicting roles, and their various relationships, so that each has clear identification in the music. This manner had, perhaps, been missing in his earlier successful duo, which had succeeded on the basis of the popular appeal of their thrusting melodies and identification with the Risorgimento. The work has a density of musical invention and melody that is perhaps only matched by Macbeth before being equalled in Rigoletto, all with libretti by Piave, and the great mature period operas that followed. As with the earlier performances of I Lombardi in Venice, Ernani had only a moderate success at its premiere, the vocal limitations of some of the soloists being to blame. It had to wait until felicitous productions at Vienna in May 1844, and La Scala in September of that year, for full recognition of its qualities. For the La Scala performances additions were made to the role of Silva with an added cabaletta in act one (tr. 12) to accommodate the distinguished bass of the time and promote the role from comprimario to primo basso. The work was the first of Verdi�s operas to be translated into English and was admired by George Bernard Shaw. It remained in the Italian repertoire in Verdi�s lifetime falling from favour in the early part of the twentieth century. Performances in the major opera houses of the world have been scarce, perhaps reflecting suspicion of early Verdi as being superficial. In the UK, Sadler�s Wells Opera staged the work around 1967 but did not tour it. I had to travel to London to catch a first glimpse of the work in stirring performance at the home theatre. Twelve years later Welsh National Opera and the Royal Northern College of Music shared a production by Elijah Moshinsky in easily manoeuvrable and evocative sets. Both have revived the production since and I have not had a bad night in several viewings with different casts. In view of Verdi�s easily listened to melodic invention I am surprised at the paucity of recorded versions in the original language. An early Cetra issue was replaced by the 1967 Rome recording with Bergonzi as Ernani and Leontyne Price as Elvira and it remains the best-sung version (RCA). Regrettably, the original recording had its rough edges and it hasn�t aged well. A 1982 Hungaroton recording conducted by Gardelli featured a vibrant Sylvia Sass and a tightly focused Ernani from Giorgio Lamberti and is now available from at mid price (Philips) in a warm atmospheric recording which has little to commend it. The1982 live La Scala performance under Muti has a starry cast of Bruson, Ghiaurov, Domingo and Mirella Freni (EMI on CD and Warner DVD). Bruson and Domingo are in superb voice whilst Ghiaurov sounds rusty and Freni strained. Add the difficult acoustic of La Scala and a firm recommendation is elusive. The most recent original language recording features the final collaboration on record of Joan Sutherland and Pavarotti with support from Nucci and Birchuladze under Bonynge (Decca). Made in 1977 it sat in Decca�s vaults for eleven years before seeing the light of day. The reason is not difficult to determine as one listens to the tenor�s tentative start, the diva�s poor diction and lack of steadiness in Ernani involami, Nucci�s nasal sound and the glottal Italian of Birchuladze. In fairness Pavarotti improves to give a worthy and at times thrilling performance. The latest studio recording is that on Chandos� �Opera In English� series with Alan Opie outstanding as the King. The foregoing leaves me in benevolent mood in reviewing this latest live recording from the 2005 Verdi Festival at Parma. Whilst I have never had a bad night in the theatre with this opera in the UK, I am uncertain how I would have enjoyed this performance from the 2005 Parma Verdi Festival. The booklet photographs show a resplendent staging and a DVD might have distracted from some rather variable singing, particularly from the male soloists. Marco Berti sang a strong Pinkerton in the admired Madama Butterfly at Covent Garden in 2004, and which he has since reprised in a revival. As Ernani he opens with a very tight tone and is none too steady either (CD 1 trs. 3-4). Although he improves, his voice shows signs of strain that I would not have expected, although his efforts at elegance of phrasing are commendable. More disappointing still is the singing of Carlo Guelfi as Don Carlo, King of Spain and rival suitor for Elvira�s hand. He was the strongly sung De Luna on Decca�s latest recording of Il Trovatore with Andrea Boccelli as Manrico. Since then he has appeared at the Met as Iago and most recently as Rigoletto. His singing is too often strained, unsteady and unfocused in a role that requires legato and strong middle-voiced enunciation (CD. 1 trs. 8-10 and 13). As Don Ruy de Silva, Giocomo Prestia has a rather gruff tone with a tight focus and little tonal palette of colour. He expresses his words and does try to create a character within these limitations (CD 1 trs 11-12). As the woman pursued by all three male protagonists, Susan Neves� Elvira is the most committed and vocally appealing singing and characterisation of any of the principals. Her introductory Sorte la notte (CD 1 Tr. 5) to her Ernani involami and Tutto sprezzo (CD 1 trs. 6-7) is a little tentative, but once into her stride her full-toned voice, with a good palette of tonal colour and variety of modulation, is a great strength to the performance. She seems to cope much better than her colleagues with the conducting of Antonello Allemandi who, in his eagerness to support his singers by allowing time for them to phrase, puts them under pressure in holding the vocal line. In the trios of act one (CD.1 Tr. 10 and act two CD. 1 Tr. 20) he ups the pace and the Verdian thrill factor kicks in for me. Likewise it does so listening to his conducting of the choral contributions portraying Ernani�s bandits, which is viscerally thrilling as early Verdi scenes of this nature should be, particularly with the chorus in virile voice as they are here. The recording is clear and the sound perspectives are realistic. The accompanying leaflet has an interesting essay about the opera in English, German, Italian and French. There is a full libretto with English translation. Like all live performances there are interruptions for applause, but none that are particularly distracting. For those who like the added frisson of live performances, compared to more sterile studio recordings, will make allowances for the limitations of individual singers and enjoy the frisson of the of Verdi�s melodies, particularly, in the chorus and concerted pieces.